Lassen Volcanic National Park. © 2018 Chris Nicholson. Nikon D5 with a Nikon 14-24mm f/2.8 lens, light painted with a Coast HP7R flashlight. 25 seconds, f/2.8, ISO 6400. Last summer, Lance and I visited Lassen Volcanic National Park to shoot for a few days (er, nights). For both of us, it was our first time there, and we quickly discovered that this Northern California wilderness is one of the best kept secrets of the national park system. The scenery is beautiful, bewildering and varied: volcanoes of different types and shapes, snowcapped peaks, reflecting lakes, babbling brooks, lush meadows, multicolor pumice fields, steaming geothermals and more await photographers and their cameras. Not to mention … deliciously dark skies. On our second day in the park, we stopped at a visitor center to talk to a ranger about possible places to photograph in the dark. She gave us a lot of great information, including an auto-tour map with suggested sites to see, and she marked the areas that she thought would be of interest to us. We ventured out for our daytime scouting, driving the main road (the aptly named Lassen National Park Highway), hiking short trails, making daytime photos (gasp!) and all-in-all enjoying the experience of being in the outdoors in such a captivating space. Along the way we stopped at a trailhead parking lot that afforded a 360-degree view of mountain peaks and valleys, all with great visual lines to the sky above them—i.e., no trees, cliffs and so on that would block our sky views in any direction. In other words, it was a perfect place to set up for a night shoot. And then we spotted what turned out to be the star of the scene: a massive boulder perched at the edge of a cliff. A scouting photo of the boulder. We were both pretty excited about the rock as a subject, as it has an interesting shape, is in an interesting place visually, is in front of an interesting background from all available angles, and we could safely set up and shoot from about 180 degrees around it. In other words, this was going to be a lot of fun. Moreover, because the cliff faces south, we knew we could get the Milky Way galactic core in the composition. So we pulled out PhotoPills to see exactly when and where the Milky Way would appear, planned our shots, and then continued exploring the park with the knowledge that we would definitely return to this spot after sundown. We arrived back at our shoot location early in twilight—so early that we couldn’t see the Milky Way yet, but that was fine because we were surrounded by many other creative opportunities. Lance ventured a little east on the cliff edge to work on a separate idea with a twisted tree, and I stationed a camera at the far end of the parking lot to rip some longish exposures over the mountain ridge to the west (Figure 1). Figure 1. Star trails over a Lassen ridge. Nikon D850 with a Nikon 80-200mm f/2.8 lens. 6 minutes, f/6.3, ISO 64. As the sky grew darker, I started working with the boulder. The Milky Way was not yet apparent in the sky, so I worked on some alternative compositions with the mountains in the background, using the silhouette of the distant ridge as a leading line into the rock (Figure 2). Figure 2. Nikon D5 with a Nikon 14-24mm f/2.8 lens. 15 seconds, f/8, ISO 4000. Once I was done with that, I looked south, and there it was: the galactic core rising over the valley. So I repositioned my camera and tripod to start working on the photo I was there to create. The valley below the cliff is a scenic wonder in daylight (in moonlight too), but in pitch-dark it was just vast blackness—so I lowered my tripod to get it out of the frame (Figure 3). 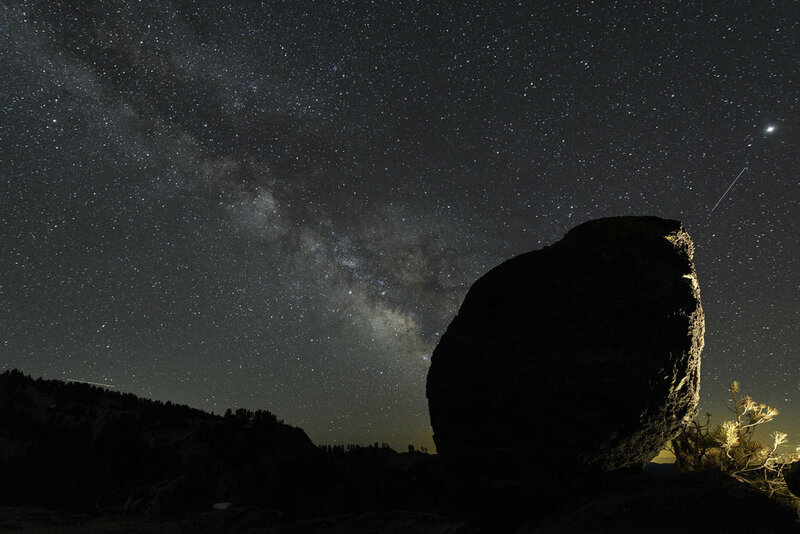 The real stars of the composition were the Milky Way and the boulder. Figure 3. Working on the composition, but with a poor-choice white balance of Daylight. Figure 4. White balance at 3800 K.
At this point you can see that Lance was in the background doing his light painting on a different subject. This didn’t bother me. First, I was only making test shots. I didn’t care about someone else’s light; I cared only about the specific elements that I was testing for, i.e. composition, focus, exposure, white balance, etc. Second, once I was ready to start executing my “real” image, I knew Lance and I could communicate and take turns light painting our different setups, and that when his flashlight was off, he and his camera would disappear into the shadows. For focus, a quick check of a hyperfocal distance chart confirmed that I could lock in on the boulder and still have the stars sharp. So I shined my Coast on the rock and auto-focused. Easy peasy. The exposure was pretty simple too. I knew I wanted sharp stars for a sharp Milky Way. Using the 400 Rule with a 14mm focal length, that gave me a top shutter speed of 25 seconds (400 / 14 = 28.57, rounded down to 25 for safety), which I shot at f/2.8 and ISO 6400. Working from the right was nearly impossible because of the cliff drop. I could have done it if I learned how to fly, but I didn’t have time for that in the middle of the shoot. When light painting, I usually want the direction of the added light to “make sense” visually, to almost look like the illumination could be coming from something else in the scene—in this case, the galactic core. 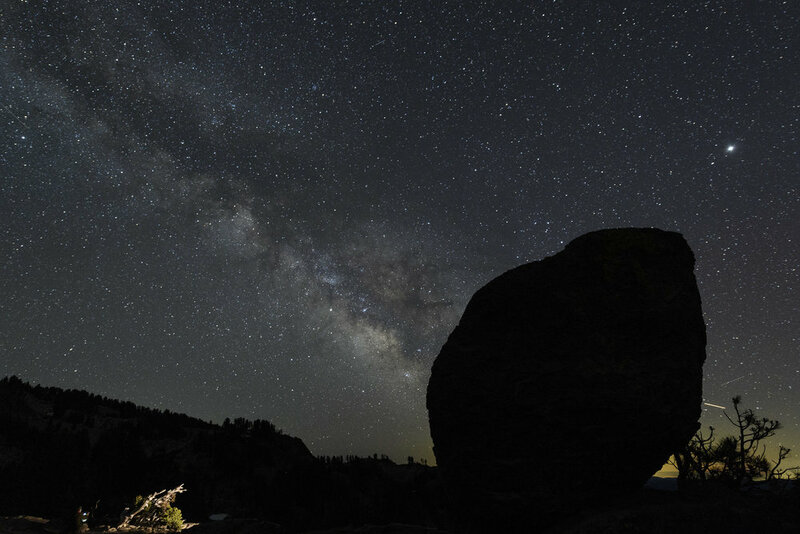 Of course no one will think that the Milky Way was actually bright enough to illuminate the boulder, but I find that the visual suggestion of it works better. Figure 5. I moved as close to the edge of the cliff as I could to light paint from camera-right, and the result proved the efficacy having the light come across the majority of frame. Also, it was nearly impossible to paint from that angle without having the light hit the sapling too. Failed iterations of my light painting approach. Or, rather, honing by trial and error. Once I’d made all of my decisions, I was ready to make the final photograph. By that point Lance had joined me at the boulder, and we took turns light painting our individual setups. Again, the key was communication, so that we didn’t inadvertently ruin each other’s images—each of us asking if the other was in the middle of an exposure before turning our flashlights on. Figure 6. The failed backlighting idea. Incidentally, while I was doing all of this, I still had my second camera, a D850, capturing star trails from the top of the hill, creating the image in Figure 7. That’s a great use for having two cameras in the field—one for long exposures and one for doing other work during the wait. Figure 7. Star trails over Lassen Peak. Nikon D850 with a Nikon 80-200mm f/2.8 lens. 13 minutes, f/2.8, ISO 160. This particular photography didn’t need a lot of work in post. I cropped out the bright star that was sitting immediately on the right edge of the frame, where it served as only a visual distraction, pulling attention far away from both the primary and secondary subjects. Using the Spot Removal tool, I cloned out a patch of snow that was picking up just enough light to be seen in the background, as well as one bright and three faint plane trails (Figure 8). I boosted Exposure (+20) and Whites (+34) to increase overall brightness, then Clarity (+19), Dehaze (+24) and Vibrance (+8) to add some punch to the sky (Figure 9). Usually I’ll go over the galactic core with a custom Milky Way brush, but I didn’t think this image needed it. Sometimes not doing something is the best decision. Knowing how to work around your limitations can be critical. Much thanks to Tim, my sister Ann and several past girlfriends for helping me color-correct through the years. Figure 11. The final image. I finished my photo before Lance finished his. 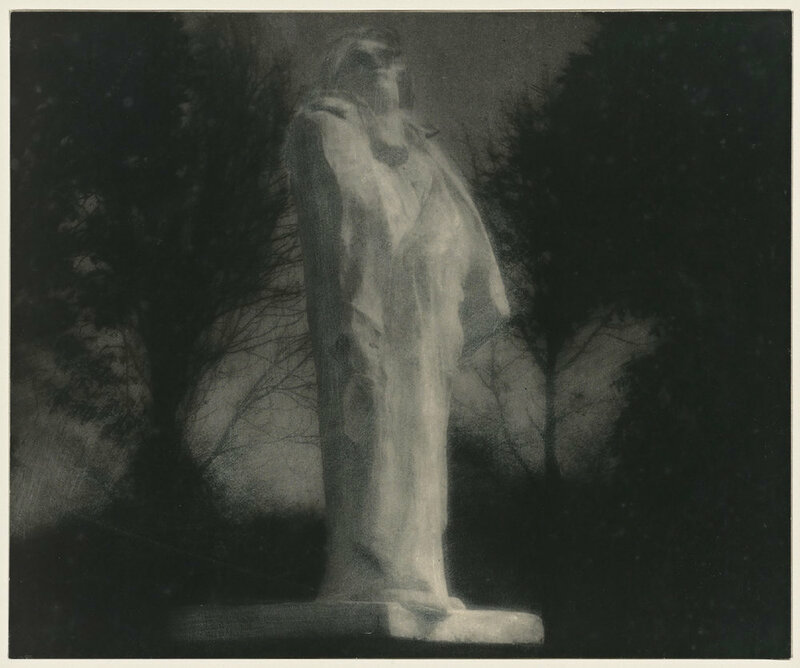 I tooled around with a few other image ideas in the same area (Figures 12 and 13), but soon settled on light painting Lance while he worked, creating a portrait of one night photography’s true masters in his element (Figure 14). By this time the moon had risen, which illuminated the valley in the background, adding more of a sense of place to the scene. Figure 12. 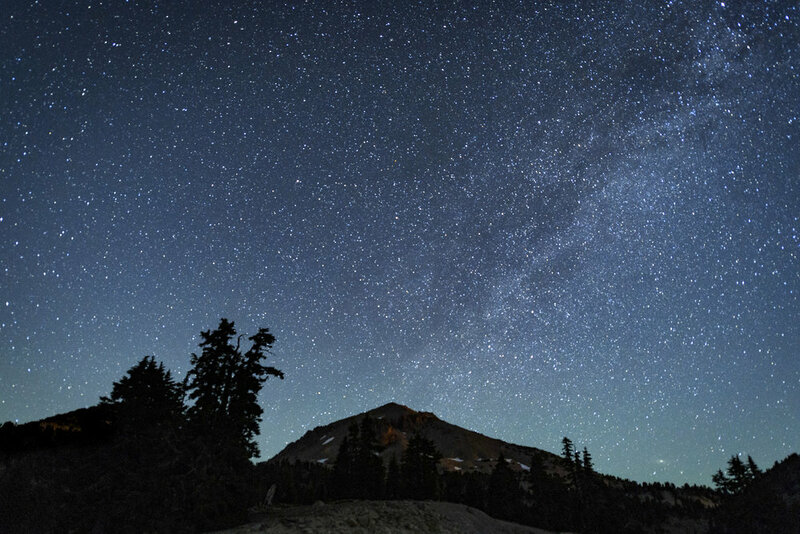 Tail end of the Milky Way over Lassen Peak. Nikon D5 with a Nikon 14-24mm f/2.8 lens. 20 seconds, f/2.8, ISO 8000. Figure 13. Milky Way disappearing in the moonrise. Nikon D5 with a Nikon 14-24mm f/2.8 lens. 25 seconds, f/2.8, ISO 6400. Figure 14. Lance at work. Nikon D5 with a Nikon 14-24mm f/2.8 lens, light painted with a Coast HP7R flashlight and a Luxli Viola LED panel. 25 seconds, f/2.8, ISO 6400. Afterward we moved on to our second shoot location of the night, a placid alpine lake just up the road, where we ripped some long exposures of star-circle reflections above Lassen Peak. Lassen Volcanic is truly an extraordinary national park. I have no idea when I’ll be back, but the day I am can’t come soon enough. 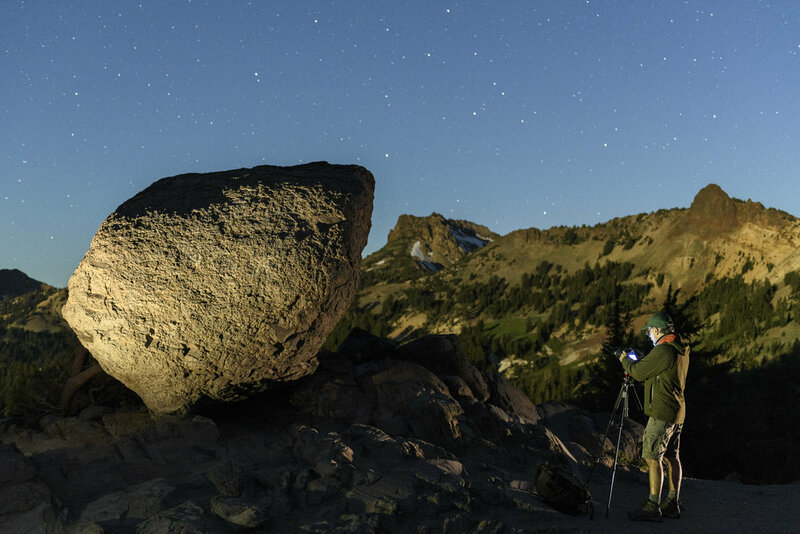 Want to explore Lassen Volcanic with Lance and Gabe on an epic night photography adventure workshop this August? Sign up here! Capturing the Milky Way is one of the great joys of night photography. But why do some photos of this celestial phenomenon look better than others? Post-processing your photos can really make the difference between a grab shot and a masterpiece. The good news is that you don’t need a doctorate in Photoshop to bring out the brilliance. A few simple tricks in Lightroom can go a long way in making your stars and Milky Way stand out. So open up an image and follow along with the video to learn how to process your Milky Way images in Lightroom! Note: Did you like that video, and think you’ll like more? Please consider subscribing to the National Parks at Night YouTube channel to get notified about all our new videos when they come out. Looking across Cinder Cone to the Milky Way, Mars, Saturn and Jupiter. © 2018 Lance Keimig. Last summer Chris and I had a chance to spend a few days in Lassen Volcanic National Park in Northern California. Lassen is one of the least known and least visited parks in the West, but it had been on both our radars for a long time. As the more popular parks like Joshua Tree and Yosemite become increasingly crowded, hidden jewels like Lassen Volcanic provide tremendous opportunities for photographers––or for anyone who wants to explore the wonder of our public lands without being overwhelmed by other tourists. Lassen peak from Cinder Cone at Sunset. iPhone 6S+. Roughly an hour east of Redding, California, Lassen is remote and far from the state’s major cities, which probably explains its relative obscurity. It certainly isn’t because the park doesn’t have much to offer—quite the contrary. In some ways, the park typifies the High Sierra landscape: rocky, mountainous terrain, rivers, lakes, wildlife, fragrant Jeffrey pines, hot days, cool nights, and clear, crisp air. Add some recently erupting volcanoes to the mix, and perhaps you can start to appreciate what makes this park special. All four of the major types of volcano are present in the park. Lassen Peak, which the park is named after, is the southernmost active volcano in the Cascade Range. It is a lava dome, and is the largest of this type anywhere in the world. Lassen Peak last erupted between 1915 and 1918. The park also contains composite and shield volcanoes, as well as cinder cone. In today’s post, I’m going to write about the appropriately (if unimaginatively) named Cinder Cone volcano. Cinder Cone from the Butte Lake Campground trailhead. iPhone 6S+. Nestled in the northeast corner of the park, far from the main visitor center, accommodations and other infrastructure, many visitors to Lassen Volcanic never get to see Cinder Cone. It’s the youngest volcano in the park, formed only 350 years ago! 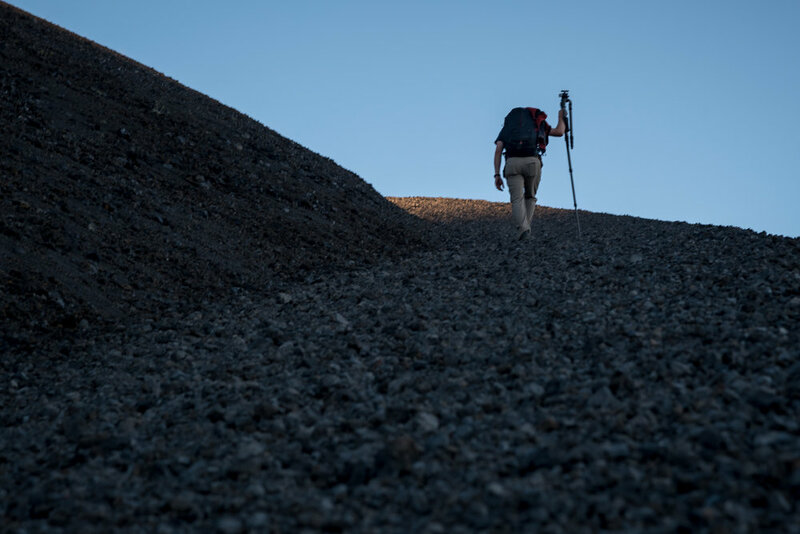 Getting to the top of the cone is one of the more challenging hikes in the park, but the solitude and the views of Lassen Peak, nearby Butte Lake and the Painted Dunes below are well worth the effort. 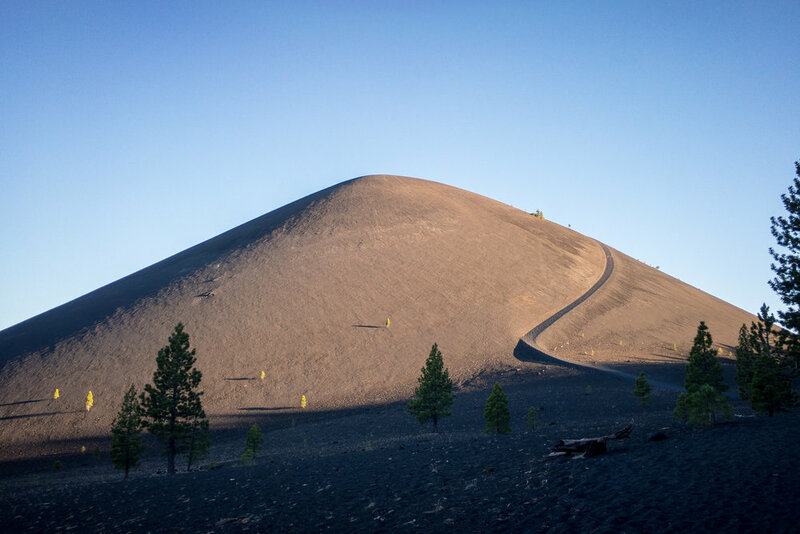 Cinder Cone has a relatively rare feature in that it contains two concentric craters, making it twice as photogenic as your ordinary volcano! Nikon D750, Irix 15mm f/2.4 lens. A 10-frame panorama. All exposures 8 seconds, f/3.2, ISO 100. We arrived late in the afternoon and made the 1.5-mile hike to the base of Cinder Cone from the trailhead at Butte Lake Campground. It was slow going, having to trudge through the forest over the loose, sandy volcanic soil, but when we rounded a bend and first saw the cone appear before us we quickened our pace at the excitement. The sun was sinking quickly as we began our ascent. Chris was determined to get to the top before the sun set, and we were literally racing the shadow up the side of the mountain. It’s a testament to how challenging the climb was that the shadow was at many times moving faster than we were. During one of our frequent stops to catch our breath, Chris said that we were experiencing “Type 2 fun.” Apparently, misery that is remembered nostalgically is what makes for Type 2 fun. It’s only in hindsight that you realize you were having a good time. It was worth every minute of the effort, and I was happy to be sharing the experience with Chris as his determination to beat the sun to the top kept me going. Type 2 Fun. Chris racing the sun to the top of Cinder Cone. Nikon D750, 24-120mm f/4 lens at 110mm. 1/60, f/7.1, ISO 100. When we finally reached the summit, the scene before us was extraordinary. We were surrounded by an awesome panoramic view on all sides, staring across a 1,000-foot-wide double crater with Lassen Peak to the southwest, Butte Lake to the northeast, and the Painted Dunes to the south. Our excitement led to newfound energies that had us circling the rim of both the outer and inner craters, but not quite enough energy or madness to descend into the inner crater, knowing we’d have to come back up at some point. The local terrain was spartan, with only a few trees and colorful low flowers dotting the landscape. We spent about an hour and a half alone on the summit, exploring, photographing and waiting for darkness. The Painted Dunes at sunset from Cinder Cone. Nikon D750, 24-120mm f/4 lens at 34mm. 1/25 second, f/8, ISO 400. We knew that once darkness set, we would have a spectacular view of the Milky Way, and that a rare planetary alignment we had witnessed earlier in the trip would present us with a unique opportunity to make a great image. We were there in early July. Mars was approaching opposition, the point where Earth is exactly between our red neighbor and the Sun. Mars was approximately 40 million miles away from us, compared to its normal average distance of 140 million miles. It was five times brighter than usual and was the brightest object in the sky after the sun and moon. Jupiter and Saturn were not to be left out, as they had just passed their own oppositions. All of this meant that if Earth was almost directly between the sun and planets, the planets would appear relatively close to each other in the sky. 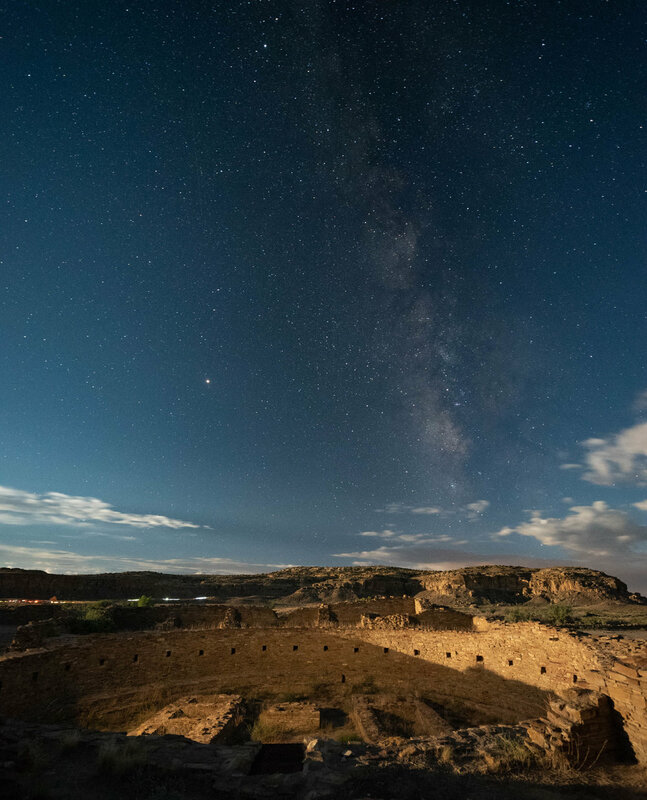 Of course, early July around the new moon is a great time to view the Milky Way too. The best time of year to view the galactic core is when it is at opposition. Can you guess where this is all headed? We positioned ourselves on the northwest side of the crater so that we could look across it to see the Milky Way and planets rise as the sky darkened. We had a pretty good idea of where the core and planets would appear based on experience and our previous nights photographing in the park. Despite having a good idea of what was coming, as astronomical twilight faded the scene before us made our hearts race with excitement. It was incredible. As the objects in the night sky brightened, the landscape before us darkened dramatically, and we wondered if we would be able to capture both the crater in front of us and the celestial glory above. We were constrained by the requirement to keep our exposures short enough to maintain the stars as points rather than trails, aperture-limited by comatic aberration, and ISO-limited by high ISO noise. Of course there are several ways to deal with the differing exposures for ground and sky in astro-landscape photography. One could compromise and have an underexposed foreground and an overexposed sky and make the best of it, or make separate exposures for each at different settings and combine them during post-processing. Because we are masochists, we decided to light paint the 1,000 feet of crater during our 20-second exposure. In this case, the composition was fairly straightforward. We knew we wanted the crater in the foreground and Milky Way above it. We aligned ourselves, and set up our cameras about 40 or 50 feet apart. Because the scene was so large, the distance between us made for only a slight variation in the foreground of our compositions. A few test shots to get the lines right, and it was time to focus. I was using the Irix 15mm f/2.4 lens, which has a convenient and accurate detent at infinity. There was nothing closer than about 50 feet in my foreground, so I knew that I could safely focus at infinity without worrying about anything being soft. I rotated the lens until I felt the detent, and that was it for step 2. On to exposure. There was no moon yet (it wouldn’t rise for another couple of hours), and only a little light pollution on the horizon from the resort towns surrounding Lake Almanor to the southeast. The standard astro-landscape (ALP) exposure of 20 seconds, f/2.8, ISO 6400 would be about right. I chose to close down one-third of a stop to f/3.2 because I wanted to minimize coma in the bright planets, which were close to the left and right edges of my frame. To compensate, I increased the shutter speed by one-third of a stop to 25 seconds, and made a test. 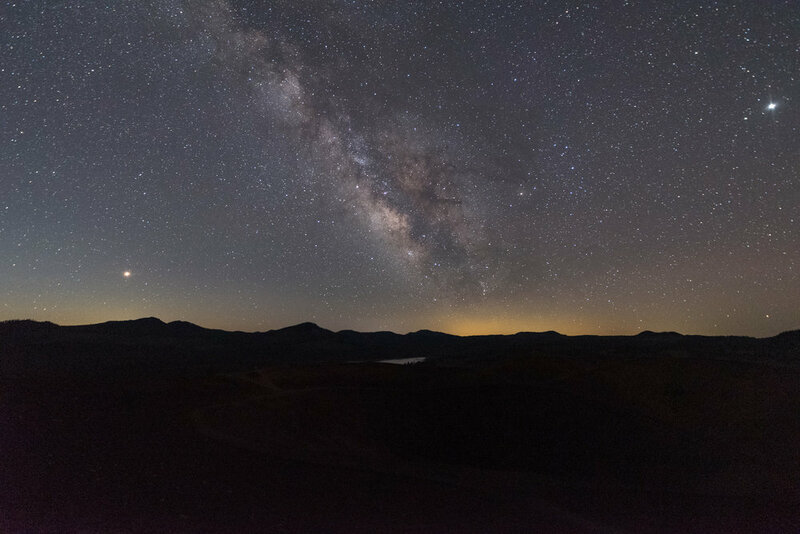 Test image looking across Cinder Cone to the Milky Way, Mars, Saturn and Jupiter. Nikon D750, Irix 15mm f/2.4 lens. 25 seconds, f/3.2, ISO 6400. Every ALP exposure is a compromise. The Earth’s rotation limits shutter speed because of the need to maintain star points. The limit is based on sensor size, focal length and the cardinal direction your camera is facing. Increase your shutter speed, and risk star trails instead of points. Open up your aperture to maximum, and risk coma and softness at the edges of the frame, as well as potential depth of field issues with foreground objects. Raise your ISO and the noise increases, especially in the underexposed shadow area common in the foregrounds of ALP images. It’s up to the photographer to decide which variable to compromise based on experience, equipment, taste and how the final image will be displayed. But I digress—on to the lighting. The final image. Looking across Cinder Cone to the Milky Way, Mars, Saturn and Jupiter. Nikon D750, Irix 15mm f/2.4 lens. 25 seconds, f.3.2, ISO 6400. Lighting with two Luxli Violas at 3200 K and 100 percent brightness for the entire exposure. Mars on the left, Jupiter on the right. Saturn is hard to make out because it is right in front of the galactic core. We really didn’t know if it was going to work or not, but there was nothing else to do but try it. We both had Luxli Violas, and the same idea. Usually we set these lights at 1 percent brightness for ALP images, and sometimes even that is too much. We are not usually trying to light the better part of a square mile in 20 seconds. We set the color temperature to 3200 K and the brightness to 100 percent, opened the shutters, and walked quickly away from the cameras holding the lights toward the crater but tilted upward so that the foregrounds would not be overly bright. The technique worked remarkably well, and after a few adjustments we felt like we had it in the bag. Note: Lance will be back at Lassen Volcanic National Park, this time with Gabe, for our 2019 night photography workshop. Click here for more information. I had another “What if?” moment, dear readers. It was this: What if I use a circular polarizer at night? It’s going to be hard to see the effect through the lens. Your sensor will capture fewer stars—perhaps? Despite all those naysaying, braying voices in my head, I set about scraping out some moments during our Rocky Mountain National Park workshop to run some experiments. 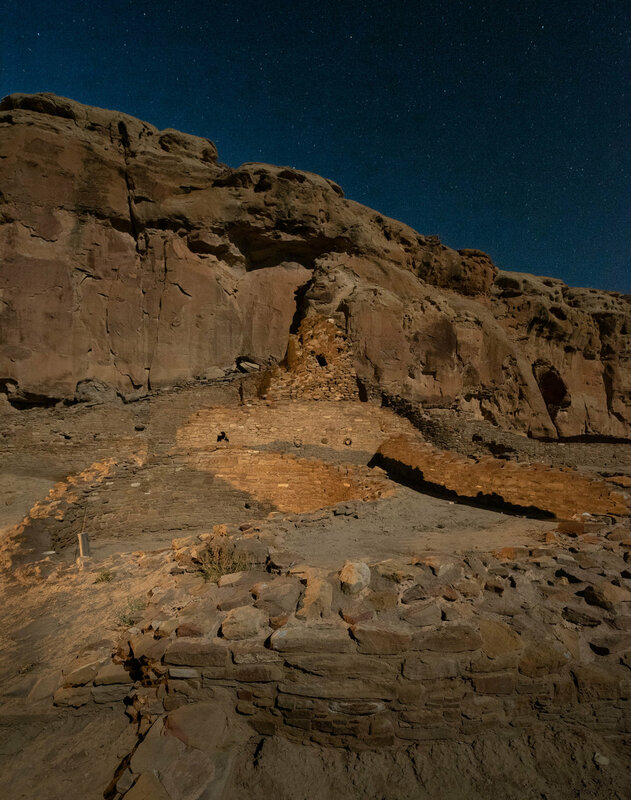 That last one was really exciting to me, as we would have lots of moon at Rocky Mountain, as well as at our workshop immediately afterward at Chaco Culture National Historical Park. Maybe, just maybe, I could make a polarizer do something useful—or even something amazing. Note: Since my polarizer was a screw-in 95mm, I did not go through the hassle of removing it during tests. I simply set it to minimum effect for the “before” images and maximum effect for the “after” images. So I set out to test my hunch that it would work. After all, it’s just science, right? On our final day of the workshop, we embarked on an add-on adventure with five attendees, during which we hiked with our gear almost 2 miles (one way) with 650 feet of elevation gain at over 8,000 feet of altitude. It was challenging, but we did it. 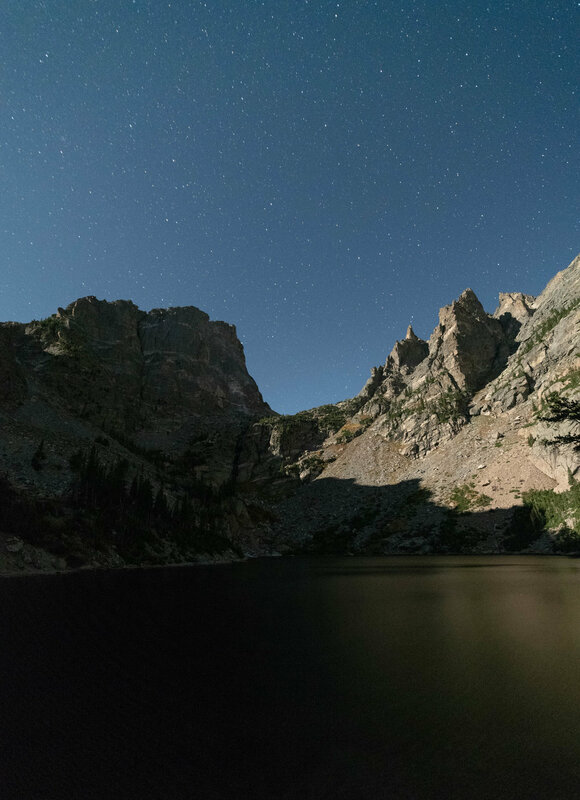 Our first shoot location, Emerald Lake, had a moon shadow slipping around to the right. The moon was at my left shoulder—ideal conditions to make a polarizer work. Tip: Polarizers work best when used perpendicular to the light source (90 degrees). So keep the moon (or sun, if you are so inclined), on your right or left shoulder. Nikon D850, Zeiss 15mm Distagon f/2.8. 30 sec, f/2.8, ISO 6400. Nikon D850, Zeiss 15mm Distagon f/2.8. 30 seconds, f/2.8, ISO 6400. Nikon D850, Zeiss 15mm Distagon f/2.8. Eight frames at 7.5 minutes, f/2.8, ISO 6400. Booyah. Many stars, despite shooting with broad moonlight. It worked! So, then I had another “What if?” moment during editing. What if I used the water from the zero-polarizer shot and masked it in to the yes-polarizer shot? Nikon D850, Zeiss 15mm Distagon f/2.8. 15 minutes, f/2.8, ISO 100. Maximum polarization (in the sky portion). Again, a wonderful solution for pulling out more stars and deeper, darker skies. Plus, if you shoot both, you can choose the best of each and blend them together. That’s powerful stuff. And then the Rocky Mountain workshop was over. … But I had another workshop (with Lance) in two days, so Chris and I hustled down to Chaco Culture. And during the second-to-last night, I had a couple of moments here and there to test again. Facing north, I wanted to test how many stars I could capture at f/13 for a star trail rip. Test shot No. 1. Nikon D750, Zeiss 15mm Distagon f/2.8. 25 seconds, f/11, ISO 3200. Maximum polarization. Test Shot No. 2, with a different polarizer orientation: Nikon D750, Zeiss 15mm Distagon f/2.8. 25 seconds, f/11, ISO 3200. Three-quarter polarization. I felt it had better skies. I wanted a touch darker, so I dropped to f/13 and I committed to a one-hour shot with Long Exposure Noise Reduction turned on. I admit, I had to do some post work to pull out the stars on the skies, but they’re there! Nikon D750, Zeiss 15mm Distagon f/2.8. 1 hour, f/13, ISO 50. Three-quarter polarization. I think next time I’ll shoot such a photo at f/8 to see a touch more stars. But it’s not the normal, cluttered sky we get without polarization and a much wider aperture. And the sky in the background is darker—much darker—which is something we don’t generally see when shooting in moonlight. But what about the Milky Way? Well, what about the Milky Way? It’s a silly question, right? You can’t shoot the Milky Way on a moonlit night. This last test, if successful, would be the coup de grace, on my circular polarizer experiments. Can I extract a Milky Way from moonlit skies? It was an idea raised by Jason, a Rocky Mountain attendee who was on that hike with us the week before. And now I could try it out. 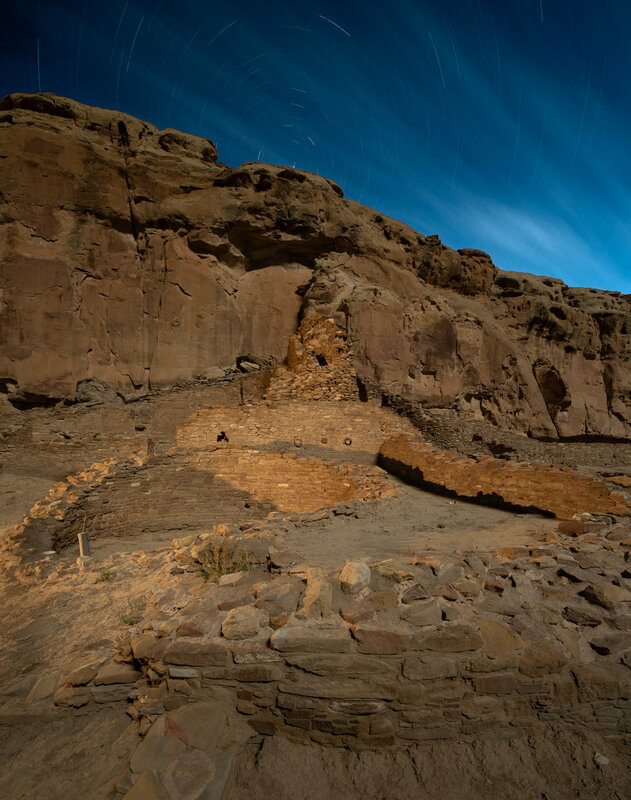 Now in New Mexico, we were shooting at Pueblo Bonito, the park’s showpiece ancient structure, which features over 600 rooms plus multiple kivas of fascinatingly intricate architecture. There was a 25-minute window of darkness between the end of twilight and moonrise. We hustled to nail the Milky Way during that window, but I suspected I had an advantage with a circular polarizer and hoped I could make it appear even after moonrise. As soon as the moon rose, people started repositioning to re-frame to make the Milky Way less important. They couldn’t see it. But … maybe I could? Nikon D750, Zeiss 15mm Distagon f/2.8. 25 seconds, f/2.8, ISO 6400. Minimum polarization. Nikon D750, Zeiss 15mm Distagon f/2.8. 25 seconds, f/2.8, ISO 6400. Maximum polarization. Double booya. Ignoring the fact that someone did light painting in the foreground for this shot, check out that Milky Way! This is not a composite. It’s one frame, with some Lightroom adjustments. You may notice that the area of sky around the Milky Way is darkest. That’s not from a local adjustment in post, but rather that’s where the circular polarizer’s effect happens. I strategically placed the effect right along the axis of the Milky Way. The polarization occurs only in that area (rather than the whole sky) because I am using a superwide lens and the effect covers a limited angle. Anyway, back to the exciting part. I was able to shoot a clear Milky Way sky with a full moon lighting the landscape. My whoops of pleasure resonated from the canyon walls. I let out massive yawps of glee. Folks, a revolution has arrived. You can put one more big gun in your bag to make your night skies sing. You can use a polarizer to photograph the Milky Way in moonlight. When Does a Circular Polarizer Not work? One caveat: When using ultrawide-angle lenses (like my Zeiss 15mm Distagon), you will discover that the area affected by polarization can be narrower than you want. I also experienced some flare when the moon was at the edge of my ultrawide lens in the above. So to avoid these two things that I found disadvantageous, I switched lenses to my 35mm, went vertical with a lens hood, and made a pano stitch (without a polarizer), and am very happy. Note: Polarizing with pano stitches is rarely successful. Nikon D850, Sigma 35mm f/1.4 Art. Ten frames at 10 seconds, f/5, ISO 6400. No polarizing filter. So watch your images to be sure the effect is one you want to commit to, but give it a shot. 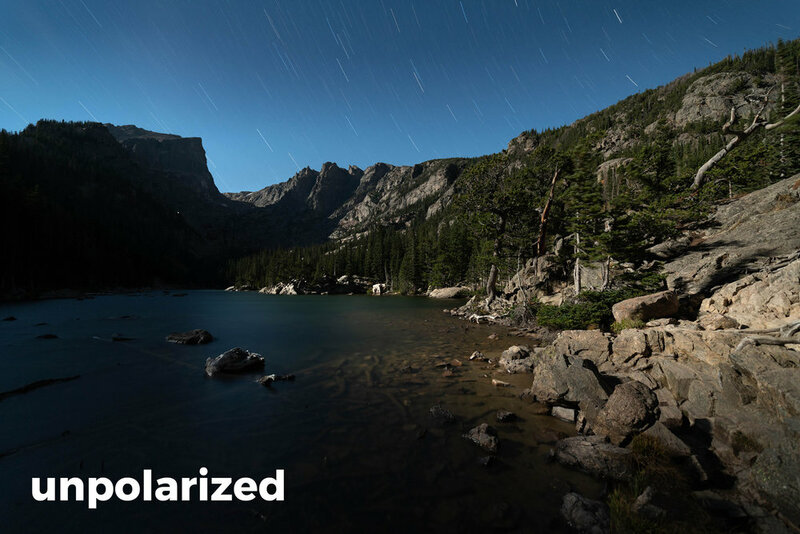 A circular polarizer is definitely worth putting in your toolkit for night photography. ’Nuff said. And I can’t wait to see what you do with this! Please test for yourself and post your results in the Comments section here or on our Facebook page. We’d love to see what amazing things you make. For you gear geeks: I used the Benro Master Slim Circular Polarizing screw-in filter on my Zeiss 15mm Distagon. In case your superwide lens doesn’t accept a screw-in, know that many manufacturers, Benro Filters included, now make 100mm and 150mm square filter holders that allow for a circular polarizer to be mounted, as well as neutral density and graduated neutral density filters. It’s an amazing photography world we live in these days.